Getting to go to Junior Olympics with Umoja was one of the best things I have ever done. Looking out at the stadium, I was wowed. It was huge, and the blue track seemed so different from the red running track of other meets I’d been to. The stadium was so big! It felt like a whole new world. The experience of competing against great athletes from all over the US was really special. I was inspired by all the girls and boys who came from different places (from New Hampshire to Wisconsin!) to be there in North Carolina. I was nervous, but once I saw all the smiling faces of the Umoja coaches, parents, and athletes, I felt so much better. I knew that even if I messed up, they’d still support me. The highlight of my experience was running relays with my fellow teammates. The time we spent together was really nice, and we bonded as a team but also as friends. The teamwork and comradery required to run relays is astounding and we all put in a lot of work to get to JO’s. It was tiring but rewarding. Stepping out onto the track, I felt like I was ready to run as fast as I could for my team. Working together as a team to create a well-oiled relay machine was awesome. The whole Junior Olympics experience helped me to feel like I belonged and was a true athlete. Running in the competition was amazing and I wouldn’t trade it for anything. Being a part of this team has helped me grow as an athlete and as an individual. I have learned so much about the importance of hard work and determination through this team and it has taken me all they way to Lawrence, Kansas. This past summer, some of my teammates and I qualified to go to the Junior Olympics in Kansas. 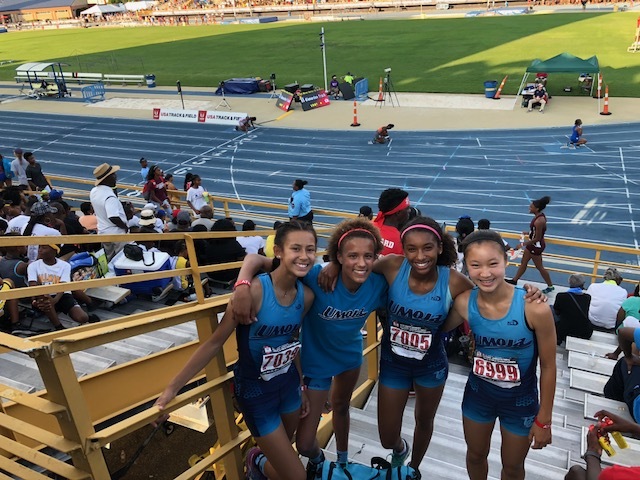 We worked really hard to be able to take part in this meet and I was so glad to see my closest friends cheering me on as I competed to become a Junior Olympic All-American. If it weren’t for my supportive coaches and loving teammates, I know I wouldn’t have been able to accomplish anything. The Junior Olympics was basically a huge learning experience. I got to see what life was like in another part of the country. I found another university to add to my list of schools I’d like to go to. But most importantly, I got to show off my hard work I put in during the track season. 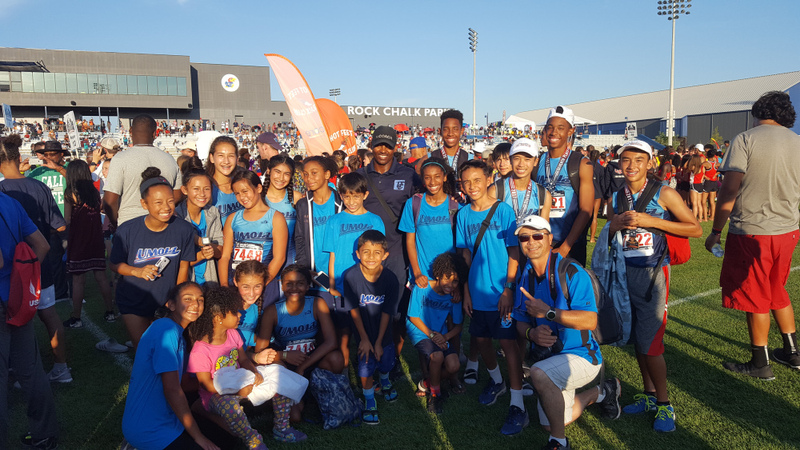 Going to the junior Olympics with Umoja was a great experience—getting to meet new people and competing against the best athletes in the nation. The first few days before the competition I was beyond nervous. But after seeing a few familiar faces, I began to settle in. My first few days were spent going around seeing places like the Jayhawk campus. But the real fun began when I started to compete. All of the competitors were friendly. Even when the competition began everyone was relaxed. Even after people began to drop out of the competition, everyone was laughing and joking. If I had to do it again, I would do it again in a heartbeat. But putting aside all of that, what I learned was that to never count yourself out, because no matter how small the chance is, it’s still a chance.